Richard Bush maps out Tokyo and Beijing’s security dilemma. Paul Giarra gives us his take. (Brookings Institution Press, 2010) is a stark reminder of how the rise of China has turned the geostrategic tables on the traditional security order in the Asia-Pacific. Some will read this work as a study of Chinese military and political-military developments; others will see it as a review of current Japanese self-defense issues under new circumstances. That Richard Bush has succeeded in combining the two is a testimony to his ability to see the interplay between different events. This is particularly refreshing given the strong tradition of specialization among Asia security scholars, who have tended to study countries in virtual isolation. This latter point is a reflection upon the increasingly unsatisfactory conventional American conceptual view of hub-and-spoke security arrangements in the Asia-Pacific, with the United States at the center and other nations conceptually isolated at the end of their individual U.S.-bilateral spokes. This deeply inculcated model was sufficient while the United States was the dominant military, political, and economic power in the region. During the Cold War it was sufficient to exclude the Soviet Union from the calculus: the U.S.-Soviet relationship was a separate, globally overarching case. Whatever the achievements of the “Russia School” in the Japanese Foreign Ministry, for instance, for all practical purposes they were irrelevant to American strategy and policy. Richard Bush has demonstrated in great detail how this hub-and-spoke model is no longer useful in this period of Chinese emergence. In The Perils of Proximity, Sino-Japanese relations are not only consequential, they are problematic and essential. Most notable is that, while during the Cold War it was Japan’s lot to deal with the alternatives of American entanglement or abandonment, now Washington has had to adjust to the realities of entanglement and abandonment with regard to Tokyo. The Perils of Proximity lays out the particular implications of a Japanese clash with China over contested territories; Chinese intrusion into Japanese territorial waters; resource disputes in overlapping exclusive economic zones; and the accrual of serious animosities stemming from the collision of interests between an assertive emerging power and an offshore nation fixed in the zone of expanding Chinese influence and power. It is impossible to overlook the intimate details of the Sino-Japanese relationship described in The Perils of Proximity. This bilateral connection runs deep on so many levels while at the same time remaining so opportune and antagonistic that its own ineluctable dynamic will play out not only because of the strategic posture of the United States in the Asia-Pacific, but in spite of it. This is uncharted territory for the three protagonists, and Richard Bush has begun to map it. While Richard Bush has done a superb job of laying out the stakes and details of the contemporary Sino-Japanese strategic relationship, The Perils of Proximity suffers on three accounts. First, it is founded on international relations theory. Bush attributes the budding Sino-Japanese rivalry to the strategic dilemma, therefore leaving both parties blameless for their actions. Certainly it would not be difficult to attribute fault – malfeasance as opposed to misfeasance – to Beijing. In fact, the historical review of the Anglo-German run-up to World War I that Professor John Maurer at the U.S. Naval War College presents is heartbreaking in its similarities to the current situation in the Asia-Pacific: a liberal, status quo government focused on internal domestic social and political issues; confronted by an irresponsible, aggressive, and increasingly militarized emerging power, determined to challenge the existing order; and oblivious to the impending civilizational disaster about to descend on its head. Second, it has already been overtaken by events since its 2010 release as China has accelerated its campaign of protecting self-declared rights. This has propelled American and Japanese friends to increasingly come together bilaterally and in multilateral fora and led the U.S. government to reassert its own interests and commitments in a way that it would not had China emerged benignly. In Japan, the specific results are contained in two important Ministry of Defense reports. The overarching 2010 National Defense Program Guidelines addressed the overall shift in self-defense emphasis toward the challenges posed by Beijing, including a renewed emphasis on Japanese defense of its southwest sovereignty claims. 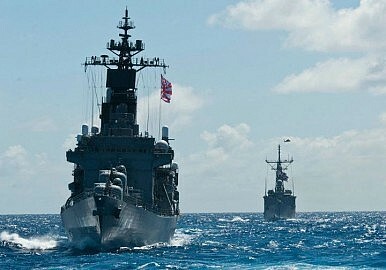 The Mid-Term Defense Program enumerated specific Self-Defense Force capability enhancements, including an expanded submarine force and possibly additional airborne surveillance platforms for more effective reconnaissance in the waters surrounding Japan. Finally, implicit in these overall strategic and political-military changes is the importance of Taiwan, at the same time diminished and amplified. Regarding the former, clearly Taiwan no longer is the exclusive rationale for Chinese military actions or Japanese and American plans and capabilities. There is far more afoot than China’s insistence upon suzerainty over Taiwan, although that certainly remains an important issue. Regarding Taiwan’s amplified importance, get out that map again. It is a key salient, no matter who controls it. Paul S. Giarra is the president of Global Strategies & Transformation, a national defense and strategic planning consultancy.